X It prefers to battle by biting apart foes’ heads instantly while flying by at high speed. X Seine bevorzugte Strategie besteht darin, seine Gegner aus dem Flug blitzartig zur Strecke zu bringen. X Il excelle dans l’art de mordre ses ennemis en plein vol, et à grande vitesse. X Su técnica favorita consiste en volar a gran velocidad y despedazar con su mandíbula a su oponente en un instante. X Preferisce piombare sui nemici a grande velocità per tagliuzzarli a dovere in un batter d’occhio. X 고속으로 날아서 스친 상대의 목을 한순간에 물어뜯는 싸움법을 선호한다. Y This six-legged Pokémon is easily capable of transporting an adult in flight. The wings on its tail help it stay balanced. Y Es kann mühelos einen Erwachsenen umhertragen. Die Federn an seinem Hinterteil stabilisieren seinen Flug. Y Il peut voler avec aise tout en portant un adulte dans ses 6 pattes. Les ailes de sa queue lui servent de balancier. Y Con sus seis patas puede llevar a un adulto y volar con comodidad. Se equilibra con las alas de su cola. Y Riesce a volare comodamente anche trasportando un adulto con le sue sei zampe. Si bilancia con la coda. Y 6개의 다리로 어른을 껴안고도 너끈히 날 수 있다. 꼬리의 날개로 균형을 잡는다. 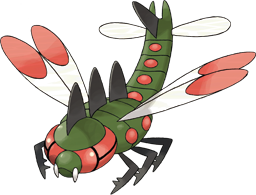 Omega Ruby This six-legged Pokémon is easily capable of transporting an adult in flight. The wings on its tail help it stay balanced. Omega Ruby Es kann mühelos einen Erwachsenen umhertragen. Die Federn an seinem Hinterteil stabilisieren seinen Flug. Omega Ruby Il peut voler avec aise tout en portant un adulte dans ses six pattes. Les ailes de sa queue lui servent de balancier. Omega Ruby Con sus seis patas puede llevar a un adulto y volar con comodidad. Se equilibra con las alas de su cola. Omega Ruby Riesce a volare comodamente anche trasportando un adulto con le sue sei zampe. Si bilancia con la coda. Omega Ruby 6개의 다리로 어른을 껴안고도 너끈히 날 수 있다. 꼬리의 날개로 균형을 잡는다. Alpha Sapphire It prefers to battle by biting apart foes’ heads instantly while flying by at high speed. Alpha Sapphire Seine bevorzugte Strategie besteht darin, seine Gegner aus dem Flug blitzartig zur Strecke zu bringen. Alpha Sapphire Il excelle dans l’art de mordre ses ennemis en plein vol, et à grande vitesse. Alpha Sapphire Su técnica favorita consiste en volar a gran velocidad y despedazar con su mandíbula a su oponente en un instante. Alpha Sapphire Preferisce piombare sui nemici a grande velocità per tagliuzzarli a dovere in un batter d’occhio. Alpha Sapphire 고속으로 날아서 스친 상대의 목을 한순간에 물어뜯는 싸움법을 선호한다. Diamond When it flaps its wings, the shockwaves created causes lethal damages to the internal organs of the foe’s body. Pearl When it flaps its wings, the shockwaves created causes lethal damages to the internal organs of the foe’s body. Platinum Its jaw power is incredible. It is adept at biting apart foes while flying by at high speed. 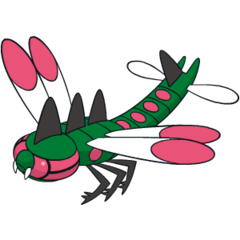 HeartGold This six-legged Pokémon is easily capable of transporting an adult in flight. The wings on its tail help it stay balanced. SoulSilver The beat of its wings is so powerful that it accidentally dislodges full-grown trees when it takes off in flight. Black Its jaw power is incredible. It is adept at biting apart foes while flying by at high speed. White Its jaw power is incredible. It is adept at biting apart foes while flying by at high speed. Black 2 It prefers to battle by biting apart foes’ heads instantly while flying by at high speed. White 2 It prefers to battle by biting apart foes’ heads instantly while flying by at high speed.